1. Preheat the grill. Melt the butter in a small pan and brush onto one side of the bread slices. Grill the buttered side until golden. 2. Stir the flour into the remaining butter and cook for a minute, stirring, then gradually whisk in the milk a little at a time and cook until thickened. Simmer for a few minutes, then take off the heat and stir in half the Stilton and the mustard. Season to taste. 3. Spread the untoasted sides of 2 slices of the bread with onion marmalade then top with the ham and scatter with the remaining cheese. Grill for a couple of minutes until the cheese has melted. Top with the remaining bread, toasted side facing up, and press down to seal. 4. 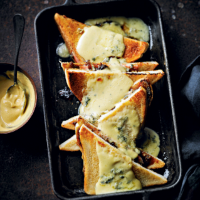 Place the sandwiches in a shallow baking dish or roasting tin and pour over the cheese sauce. Grill for about 3 minutes until golden and bubbling, then serve with extra Dijon on the side.